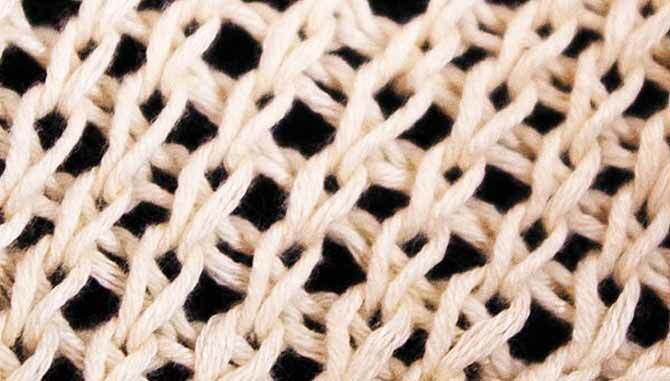 The first item I would knit with Universal Yarn’s Bamboo Pop would be a market bag or a purse (I would have to sew a lining for it, though) with this fabulous diamond lace stitch pattern. 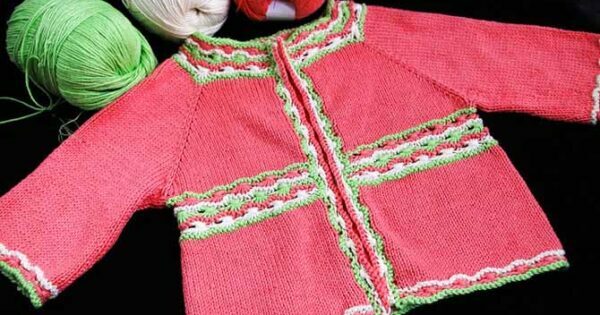 The bamboo and cotton is a sturdy yarn and this diagonal lace stitch is sturdy and beautiful at the same time. It almost looks like Tunisian crocheted lace, but it’s true to goodness knitting. I think a market bag out of this yarn would be a really classy item to take with me to the farmers’ market on the weekends. The stitch pattern is below. Cast on an even number of stitches and add 2 stitches, one for each side as a selvedge stitch. You can use the selvedge stitches to seam up the sides of the bag. Row 1 (RS): K1, *insert RH needle into front leg of 2nd st on the LH needle to knit, wrap the yarn around the needle twice, and knit, then knit the first st on the LH and slide all sts to the RH needle; rep from * across to last st, k1. Row 2: K1, p1, *insert RH needle into front leg of 2nd st on the LH needle as if to purl, wrap the yarn around the needle twice, and draw through, then purl the first st on the LH needle dropping the extra wrap; rep from * across to last 2 sts, p1, k1. Row 3: Rep Row 1, dropping the extra wraps when working those stitches. Rep Rows 2 and 3 for pattern. I didn’t have enough time to make one for the blog, but I would definitely knit a men’s sweater from Bamboo Pop. It has a great drape and would fit well on a male form. It would be cool to wear in the winter if the guy is hot-blooded, yet I know it would really look high-end because of the drape and stitch definition. I know some would think the bamboo too shiny, but there isn’t enough shine to look like your wearing sequins or glitter. Any textured stitch pattern would really show well with any of the solid colors. My yarn label says 20 sts to 4″ on US4 [6mm] needles, but I think that my particular label has a typo on it. That should be 4mm needles are a US6. So it’s officially a DK weight (CYC#3), but I knit with a US3 [3.25mm] and there was still lovely drape at 30 sts to 4″. To me it’s a very versatile yarn if it can span so many different gauge possibilities and still knit up well. I would make ALL kinds of baby garments and items out of Bamboo Pop. It’s extremely soft. There are many great colors for any kid’s wardrobe, and the fabric washes and wears very well. It holds stitch definition well, too. I did have enough yarn and enough time to knit a little top for a 9-month girl. I haven’t found the right buttons for it yet, but I think some plain white pearl ones will do great. What do you think? How would you change the pattern? The pattern will soon be available in my Ravelry store in 4 or 5 sizes. I still have a lot of math and pattern writing to do to get it just right. No, those edgings and color pattern work is not crochet. It’s a lovely little stitch pattern that involves extra yarn wraps and then wrapped stitches. 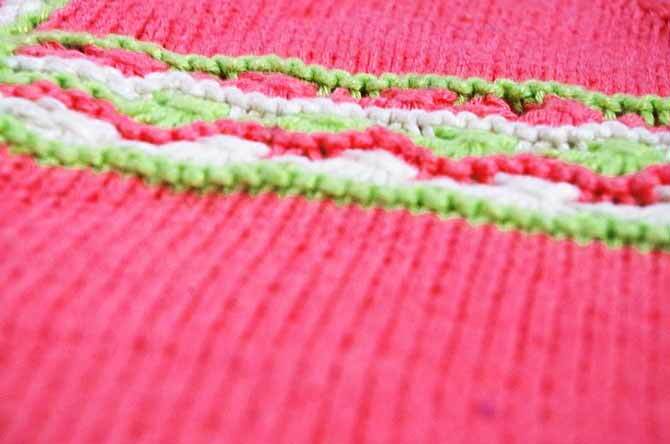 I will share how to make this wrapped stitch pattern tomorrow. Join me. 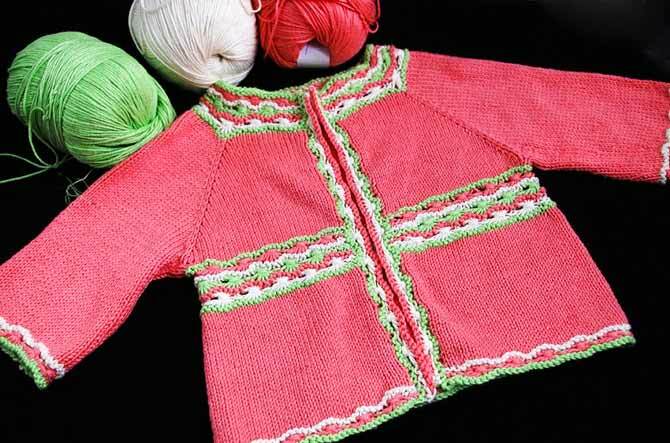 Have you published the pattern for Bamboo Pop Project 3, the baby sweater with wrapped stitches? Hello Lisa. I still haven’t written the pattern for all the sizes, and then I’ll need to send it to a technical editor or a tester to knit another sample. Please stay tuned.